What recipe are you known for amongst your friends and family? Here we go with using the Dec 2014 blogging prompts. I make the best shortbread in the world. I learned my Great Granny Snow’s secret recipe from my Aunt Wendy. Why Great Granny chose Aunt Wendy from among all her granddaughters to teach, and why Aunt Wendy chose me from among all her nieces to teach, is a mystery, but I believe it’s ‘cuz Aunty Wendy loved me the best! (Feel free to correct me if I’m wrong on that, Aunt Wendy). Now, there are two things about this recipe. One thing is that it is really all in the technique. 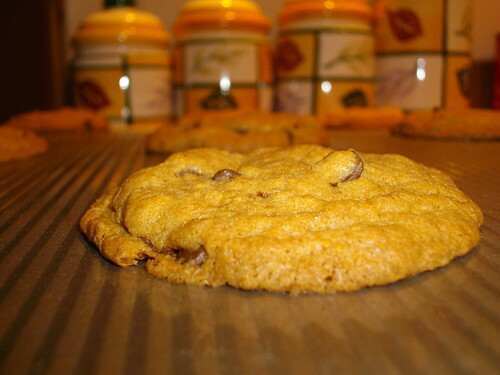 I could give you the list of ingredients (even the super secret tip about one of the ingredients) and the instructions, but you wouldn’t be able to make these cookies. When my Aunt Wendy taught me this recipe, she showed me something about the dough that I have never told anyone and never written down. And it is the key to making the best shortbread in the world. The second thing is – I don’t even like shortbread. After a hectic weekend of getting my taxes done1, doing homework, watching the Canucks at a pub, and a crazy amount of unpacking, I decided this evening that it was high time that I christened our new kitchen with some Snow baking. 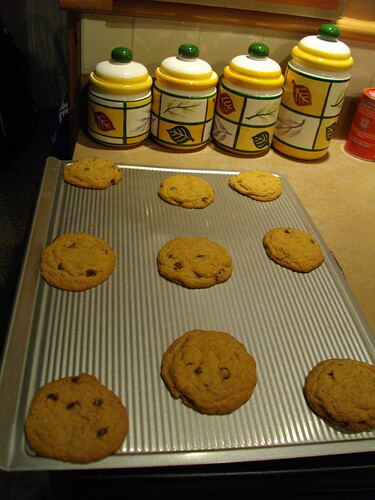 Given that I’m freaking exhausted2, I went with something simple: chocolate chip cookies. The secret to their deliciousness, I think, is the use of real butter, both white and brown sugar, and my own homemade vanilla extract! I wish you were all here to try one! So remember last year how I cyber-baked with my family over the intertubes? Not this year! This year I got to do my baking in person! 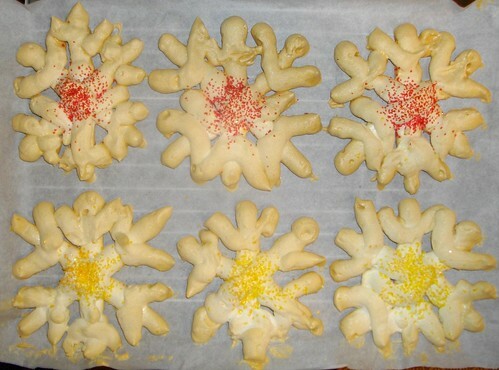 Baking, and especially Christmas baking, is one of my fondest memories from childhood. 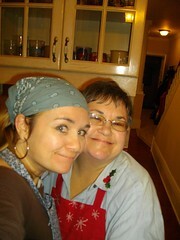 Every year at Christmas time, my Aunt Wendy would come over to our house and bake with my mom, my sister and me. 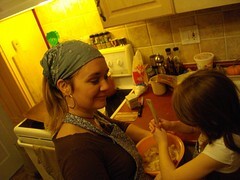 Over the years, various other people joined us for baking good times and we always had a blast AND made delicious treats to give out to people! Baking simultaneously in Toronto and Vancouver while chatting via Google Video last year was fun, but nothing beats baking together with the fam. This year, my sister’s friend Daniel joined us. Daniel was an early childhood educator at the daycare my niece went to and later was a babysitter for her. And he’s a tonne of fun, so he graduated to friend status and when he mentioned to Nancy that he was going to be doing his Christmas baking alone this year, she invited him to join us. 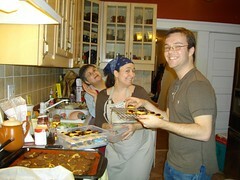 Of course, this made for five bakers – my mom, Nancy, Madeline, me and Daniel – all in one kitchen. And we each had three different things we planned to bake! 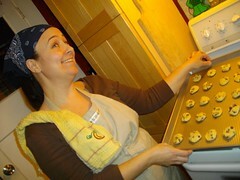 So Nancy, ever the creative problem solver, recruited the oven of the next door neighbours for the afternoon! 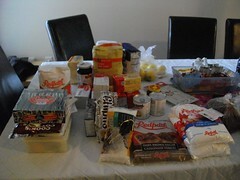 At noon today1, the first annual Snow CyberCookies bake-stravaganza ’09 began! Five hours later, two kitchens were full of all sorts of baked goodness! My sister, my niece and my mom baked up a storm in Nancy’s kitchen in Toronto – they made whipped shortbread, chocolate sandwich cookies, peanut butter cookies and spiced cashews2. I made my famous shortbread, meringue snowflakes and chocolate mice! Baking something for the first time, I find, never goes quite as planned. 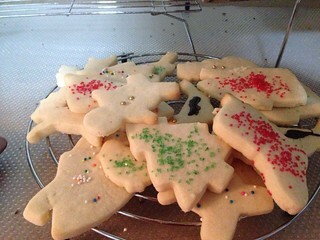 My shortbread cookies, from a family recipe I’ve been using for about 20 years, are perfect, but the other two items didn’t turn out exactly as planned. The mixture for the centre of the chocolate mice, which is made from sweetened condensed milk3 and melted chocolate, was far more gooey than it should have been, so I had to put the mice in the freezer to get them firm enough to coat in chocolate. 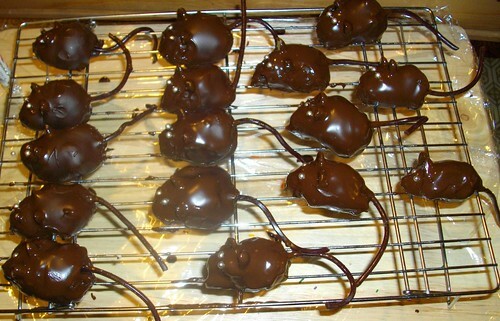 Also, the chocolate coating solidified pretty quick, so by the time I had coated all the mice, I only had enough time to get their candy eyes on before they were hardened – the were meant to have whiskers and noses too, but I just wasn’t quick enough for that4. I still think they are pretty cute though. 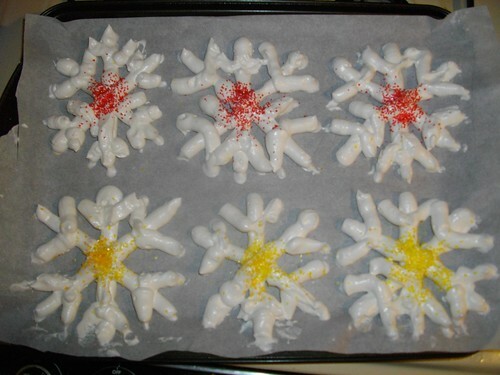 The meringue snowflakes, while more successful than my meringue ghosts, still didn’t turn out quite as nicely as I would have liked5. I think I needed a slightly smaller tip for my piping dohickey6. So, maybe not perfect, but they taste good, and that’s the most important thing, right? And we all had a good time “hanging out” via Google Video Chat. 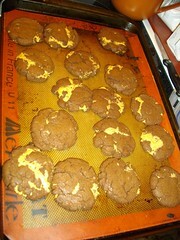 The only drawback – I really wanted to try those spicy cashews and chocolate sandwich cookies! When is Google going to release its Google Teleporter? 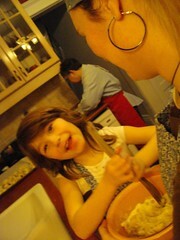 When we were little, my sister and I did a lot of baking with our mom. At Christmastime, my Aunt Wendy would come over and we’d bake up a storm – cookies and squares and crazy concoctions from recipes in Canadian Living magazine. I distinctly remember learning fractions in elementary school and thinking “this is SO EASY” because I’d already learned fractions in the kitchen, where everything is measured in 1/2s or 1/4s or 1/8ths of cups or teaspoons or tablespoons1 and if you want to double a recipe, or halve a recipe, you learn pretty quick how to deal with numerators and denominators. As we got older, my sister and I both continued our love of baking and when we both had our own places and I still lived in Ontario, we’d go to one another’s apartments to do our Christmas baking today2. Well, this year we’ve decided to resurrect our tradition of doing our Christmas baking together, despite the fact that we live thousands of miles apart. So “together” in this case is being given a little assistance from the Internet, Skype and our respective MacBook Pros. That’s right folks, I’m going to be baking at my house and Nancy & Madeline & my mom will be baking at Nancy’s house and the whole thing will happen on webcam! While it’s not quite as good as in person3, it’s the best I’m going to get, so I’m going with it.